Amazon wants to ramp up its car parts business to compete with the big boys like O’Reilly Auto Parts, Autozone, Napa Auto Parts, and Advance Auto Parts, the New York Post reports. Will we all soon be buying even more of our parts from Amazon instead of the box stores? The newspaper has it from sources that Amazon has already penned contracts with major car parts suppliers like Federal-Mogul, Robert Bosch, Dorman and Cardone Industries in a quest to jump into the deep end of a $50 billion aftermarket replacement parts industry. Steve Handschuh, the CEO of the Motor & Equipment Manufacturers Association, and a man whose hands are never cold, told the site that Amazon could also lay some ink with regional parts distributors, further bringing the hurt to the major brick-and-mortar stores. 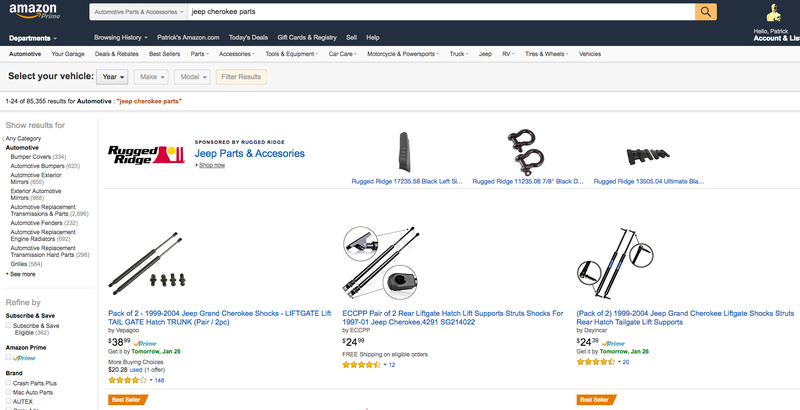 So, will all of us wrenchers be buying our parts online from Amazon? I think many of us already are. I myself buy quite a few parts from the online retailer, as prices are hilariously low. I mean, I can buy a radiator for my Jeep for under $50! And if I want a better name-brand, I can get a Spectra one for less than $75. I’d venture to say that more people buy car parts from the hugely popular online car parts company RockAuto, but that website is clunky, so there’s definitely room for Amazon to swoop in on some of that business. But even though I do buy parts from those two online retailers, I still go to brick-and-mortar car parts stores, and that’s for a couple of reasons, the most important of which has to do with speed. Even if Amazon offers same-day shipping (the New York Post cites investment bank Jeffries as saying Amazon does offer this service in 40 U.S. cities), wrenchers in the middle of a project prefer running to the store and grabbing their thermostat or brake pads or whatever so they can finish the job without waiting for the postman, even with fast Prime delivery. This is especially true for lower-cost ancillary items like greases, oils and seals. There’s also the fact that sometimes you either get a bad part, or you order the wrong item. Being able to run back to the store to replace it is very important when you’re trying to complete a job without dragging it out for weeks. Add to that the fact that, sometimes, the clerks at car parts store can provide great firsthand advice on which parts to get and how to complete your project, and I think the big car parts stores still have plenty to offer over online retailers. Still, especially for the bigger, more expensive items (like the radiator I mentioned above), the savings Amazon offers will definitely lure in lots of customers from the chain stores. With this new push to crank up its volumes, we’ll see how our local stores hold up.